1 (16 ounce) package of spaghetti broken in half. 1 seeded and chopped cucumber. 1 (10 ounce) bottle of Italian salad dressing. 1 tsp of poppy seed. ¼ tsp of celery salt. 1 tsp of sesame seeds. ⅛ tsp of garlic salt. First cook the spaghetti according to package instructions and drain. 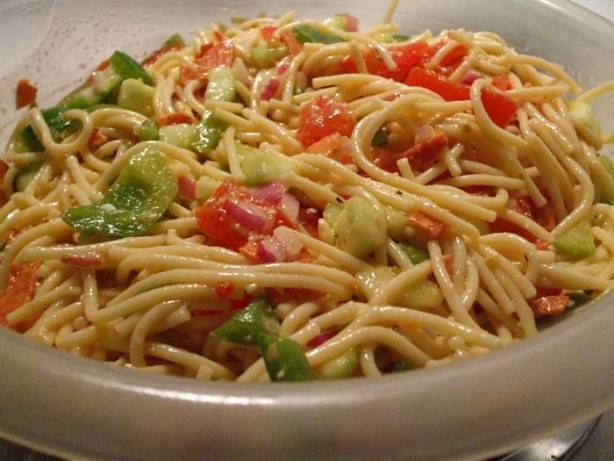 Mix together the spaghetti and vegetables in a large bowl. Mix together the rest of the ingredients in a small bowl then pour over the spaghetti and toss to coat. Refrigerate for 4 hours at least or overnight and toss before serving.